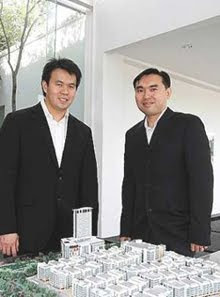 Modern street mall: Tan (left) and Millennium Land senior operations manager Chua Chin Eng with a model of Millennia City. PUCHONG: Millennium Land Sdn Bhd will embark on a RM1.5bil mixed-development project, M Square, which it is optimistic will become the new commercial centre for Puchong and turn it into a trendy township. Located on 10.12ha, M Square comprises a 380,000 sq ft shopping mall located in the podium block below the 18-storey 255-room Hilton Garden Inn and a 2.1 million sq ft street mall comprising of 13 six-storey blocks of retail and office units. The development will start by the third quarter this year and is targeted for completion by 2014. Millennium Land executive director Benjamin Tan said the company also planned to build residential units targeted at the higher income group. “Puchong is one of the fastest growing districts in Malaysia in terms of growth especially in three key areas population, monthly household income and commercialisation. “The primary catchment in Puchong reaches an estimated 420,000 people while its secondary catchment area, some 10 minutes away, reaches some 1.2 million people,” he added. International hotel chain Hilton Worldwide will be managing the 255-room Hilton Garden Inn Hotel set for opening in 2014. It is targeted at business and leisure travellers. Tan said one of the project's main selling points was that when completed, it would showcase the largest street mall in the country. “It ties in together with today's lifestyle trend with alfresco dining and outdoor live performances amid a conducive environment,” he said. He said the project's major pull factors included its size which puts it into the regional mall category. The size allows for a good tenant mix, and the ambience of a street mall will give it a very different feel compared to the other shopping centres. “Our design, being modular, allows for flexibility as it does not have lift shaft in the centre like other conventional shop lots. Instead it is served by glass lifts on the exterior of the building,” he said. “For the convenience of shoppers, every block was planned to cater to specific target markets, such as a Kids' Corner, Japanese Street and Digital Centre that can take up an entire block or a large portion of it, and by itself serves as an anchor tenant,” he added. PETALING JAYA: Dijaya Corp Bhd's golf-fronted luxury condominium development, Tropicana Grande, has been named the “Best Residential High-Rise Development” in Asia Pacific at the 2011 International Property Awards in Shanghai recently. The development was also named the best residential high-rise development with the highest five-star rating in Malaysia in the competition held on May 31 in association with Bloomberg Television and Google. Dijaya managing director Datuk Tong Kien Onn said in a statement yesterday that the awards were testimony to the company's efforts to create its Tropicana-branded products that offered buyers more than just properties, but also contemporary lifestyle living. George Town: Ivory Properties Group Bhd confirms that it has responded to a tender to develop over 40 hectares of land at Bayan Mutiara on Penang Island. "I can confirm that we have submitted a bid by responding to the Penang government's request for proposal to develop the land and are now awaiting word from the state authorities," the company's deputy chairman and executive director Datuk Seri Nazir Ariff Mushir Ariff told Business Times after Ivory Properties' first annual shareholders' meeting. Last Tuesday, Business Times reported that Ivory and SP Setia Bhd are in the race for a multi-billion ringgit development of some 40.47ha land at Bayan Mutiara. Both companies have already established their presence as property players in the southwestern part of the island via existing developments. Sources had said that of the two companies, Ivory Properties had submitted the higher bid, for which the reserve price was reportedly set at RM200 per sq ft.
Nazir, however, declined to comment on this. The state government had asked for a request for proposal (RFP) via Penang Development Corp to develop an initial 24.8ha, which is located south of the Pe-nang Bridge, overlooking Pulau Jerejak. The RFP comes with the potential to develop an additional 14ha via a future re- clamation after the development of the initial 24.8ha land. Meanwhile, Ivory Properties' operations director Murly Manokharan said luxury condominiums are set to be the group's next offering in Batu Ferringhi, where Ivory has already established its presence as a property developer. Unlike its Moonlight Bay and Island Resort developments, which are sited on hillslopes commanding ocean views, the proposed The Bay development is set to be located on the beachfront. Murly said the proposed development will comprise a single block of low-density condominiums, in compliance with environmental and developmental requirements set by the local authorities. "We are hoping to offer units with large built-up areas ranging from 3,000 to 5,000 sq ft and they will likely be priced between RM600 and RM650 per sq ft," he said. Ivory Meadows, a wholly-owned subsidiary of Ivory Properties, entered into a conditional agreement last year with Lim Soon Hin and Lim Soon Vin to buy 0.49ha of freehold land in Batu Ferringhi for RM25 million. The project is expected to be completed three years after construction begins. Also on the cards for Ivory Properties is the proposed City Mall located in Tanjung Tokong, which is set to be a mixed development project of luxury condominiums perched above a shopping mall. "We are awaiting approvals from the local authorities before proceeding with this project which we hope to launch by the fourth quarter of this year," Murly said. The project, with RM433.3 million gross development value, is set to offer 300,000 sq ft of shopping space and is expected to cater to tourists in meeting their dining, rest, travel and information needs. Murly said the resident component, meanwhile, is set to cover 120,000 sq ft.
Property watchers said the proposed development is set to boost the area's new positioning as Penang island's new lifestyle and commercial hub. Fronting the Island Plaza shopping mall, Ivory's proposed mall is set to join the ranks of projects that include Eastern and Oriental Bhd's master-planned Seri Tanjung Pinang development, Boon Siew Property Group's Precint 10 food and beverage mall, and IOI Properties' upmarket Fettes Residences condominium project. PETALING JAYA: Lifestyle property developer Eastern & Oriental Bhd (E&O) and Japan's largest property developer Mitsui Fudosan Co Ltd are looking at opportunities to jointly develop residential properties in Malaysia and the region. Partners: (from left) Zushi, Shotaro and Eric Chan at the collaboration signing ceremony. “This is a significant start,” said E&O deputy managing director Eric Chan after signing a marketing collaboration agreement with Mitsui Real Estate Sales Co Ltd, the real estate brokerage arm of Mitsui Fudosan. Mitsui Fudosan is one of Japan's corporate giants whose parent company, Mitsui Group, goes back to the Edo period. Mitsui Fudosan is listed on the First Section of the Tokyo and Osaka Stock Exchange and as at March this year, its total assets stood at US$47bil. “With a market cap of US$15bil, they are not here for the (brokerage) commission,” said Chan. Mitsui Fudosan (international department planning and administration group) executive manager Chishu Zushi said the marketing collaboration was the first step in other future collaborations. “There will be other collaborations later on. We have been looking at various opportunities in the (residential) development business. It can be in Malaysia, Singapore or Japan, but it is too early (to announce) anything right now,” he said. Future joint residential developments may involve E&O's existing projects or may include new ones, but yesterday's marketing partnership was project specific, that is to sell St Mary Residences in Kuala Lumpur and the Quayside Seafront Resort Condominiums in Penang. The partnership would last until everything was sold, said Chan. E& O has several projects, the largest of which is the 980-acre seafront development Seri Tanjung PInang in Penang. The first phase comprising 240 acres has been completed. It also has pockets of land in Jalan Kia Peng and Jalan Yap Kwan Seng in Kuala Lumpur and 365 acres at Gertak Sanggul in Penang plus bungalow lots in Damansara Heights. Chan said about 20% of its buyers for both its Seri Tanjung Pinang and St Mary Residences in Penang were foreigners, with British being the largest group and Japanese the second largest group. The percentage of foreign buyers for its Kuala Lumpur properties is smaller. Ishihara Shotaro, the managing director of Tropical Resort Lifestyle Sdn Bhd, a Japanese support company that will be facilitating the cross-border collaboration said the number of Japanese buyers was expected to grow after the March 11 tsunami and earthquake. “They invest in properties priced between RM1.5mil and RM2mil with built-up of 700 to 1,500 sq ft. They have found that investing here has been pretty rewarding compared with their investments in Japan. In Singapore, property prices are very high. We see greater possibilities here. After the March 11 tragedy, they are also looking for a country with no natural disasters,” said Shotaro. KUALA LUMPUR: Property developer Eastern & Oriental Bhd (E&O) expects to launch four new blocks at its Quayside Seafront Resort and Condominiums project in Penang this year. Its deputy managing director Eric Chan said the company was optimistic about the project. "So far, out of the total seven condominium blocks planned under the project, three have been launched with more than 75 per cent taken up," he said, noting that phase one will be completed by 2013. The Quayside project is also home to Malaysia's largest water themepark. Speaking to reporters after signing a marketing agreement with Mitsui Fudoson Co Ltd yesterday, Chan said one more condominium block will be launched next month while the rest is scheduled for launch either by the year-end or early 2012, with gross development value at more than RM2 billion. Mitsui, Japan's largest property developer, through its unit, Mitsui Real Estate Sales Co Ltd, will market E&O properties to its high net worth clientele in Japan. Chan said the collaboration is the first step that marks the beginning of efforts to bring the homegrown E&O brand to the Japanese market. "We are honoured and excited by the opportunities presented by this collaboration with a giant like Mitsui," he said. Besides E&O's Quayside project, other projects to be marketed in Japan include the company's St Mary Residences in Kuala Lumpur, due for completion next year. "Our products are local but we believe demand can be global, especially if our standards of quality and innovation are international," he said. KUALA LUMPUR: 1Malaysia Development Bhd (1MDB) has signed an agreement to buy and transfer a 200.5ha airport land in Sungai Besi, which will be transformed into Bandar Malaysia. 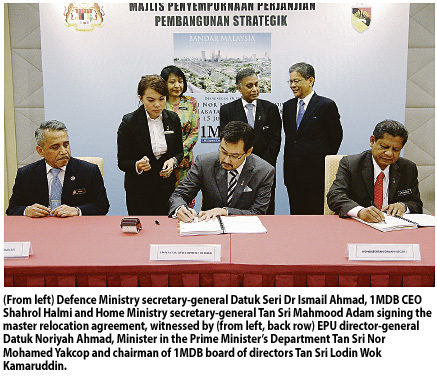 1MDB, as the master developer of the project, signed the deal yesterday with the Federal Land Commissioner. A second agreement between 1MDB and the Menteri Besar Incorporated of Negri Sembilan was signed for the latter to buy 303.8ha in Sendayan. This location will be the replacement site for the Royal Malaysian Air Force. At the same time, 1MDB also entered a master relocation agreement with the Ministry of Defence and the Home Ministry to develop eight replacement sites. "Bandar Malaysia will have several attractive elements to further strengthen Kuala Lumpur's global competitiveness as cities compete to attract international investors and businesses," 1MDB said in a press release. "Bandar Malaysia aims to promote livability as a distinctive cha-racter of Greater Kuala Lumpur. It will be a mixed development filled with livable space for/ life balance such as open green space and people's avenue as well as higher learning institutions," the statement added. Tan Sri Nor Mohamed Yakcop, the minister in the Prime Minister's Department witnessed the signing at the Economic Planning Unit of the PM's Department. 1MDB was represented by its chief executive officer Shahrol Halmi. Its chairman Tan Sri Lodin Wok Kamaruddin was also present. The release added that this is the third game-changing use of the historical site. In 1956, it served as the first international airport and it was also the birthplace of RMAF from where it grew to become an ultra modern air force.